My initial impulse for Skin Tags was to survey the skin tones represented in Vogue, an iconic fashion magazine. I use a hole punch (5mm and 7mm) to take samples. The parameters for taking samples are to take one sample from each person represented in the magazine. The samples come from only colour images and must have an area of skin large enough to fit the diameter of the hole punch. Subsequent surveys involve the use of a template to draw half inch circles from the skin, which are then cut out with scissors. The small circles are then glued onto a sheet of machine made rag paper in a grid format. There is a connection to Byron Kim’s Synecdoche, which is an ongoing project begun in 1991. He steps out of his studio and asks passerby (as well as family and friends) to allow him to paint an 8×10 inch portrait of the their skin tone. “Synecdoche” refers to a figure of speech in which a part is used for the whole. Here Kim takes a fragment, a person’s skin colour, and allows it to stand in as a signifier for the whole person. He also says the “whole piece represents all of us in a way” (Kim). Synecdoche however, does not represent all of global humanity. It represents a sample of people from a particular location (the environment around his studio and those within his circle of contacts) as does Skin Tags (women, and men, selected to represent a particular standard of beauty in the US). Both works reduce a person to a colour that stands in for race. In the case of Skin Tags, the gridded clinical assessment aims to render Whiteness “strange,” to give it a peculiarity that might otherwise go unnoticed (Dyer 4). In fact the removal of the samples from their original context, and the separation of Kim’s coloured panels from people offers new questions (although he does provide an alphabetical listing names). Are all the lighter skin tones from Whites? Where does White end and non-White begin? Berger, Maurice, Wendy Ewald, David R. Roediger, and Patricia J. Williams. 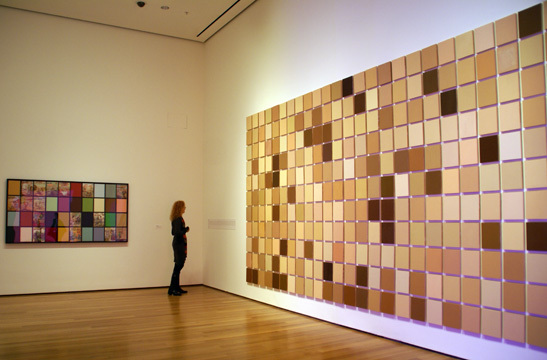 White: Whiteness and Race in Contemporary Art. Baltimore, MD: Center for Art and Visual Culture, University of Maryland Baltimore County, 2004. Print. C Way. “Art of the Day: Stills from Paul McCarthy & Mike Kelley’s “Heidi: Midlife Crisis Trauma Center and Negative Media-Engram Abreaction Release Zone” (1992).” Web log post. Snailcrow. 11 Dec. 2011. Web. 12 Jan. 2012. Dyer, Richard. White. London: Routledge, 1997. Print. Ewald, Wendy. American Alphabets. Zurich: Scalo, 2005. OpenDemocracy. Open Democracy, 13 Mar. 2006. Web. 11 Jan. 2012. Gustafson, Diana L. “White on Whiteness: Becoming Radicalized about Race.” Nursing Inquiry 14.2 (2007): 153-61. EBSCO. Web. 14 Nov. 2011. Hyde, Katherine. “Portraits and Collaborations: A Reflection on the Work of Wendy Ewald.” Visual Studies 20.2 (2005): 172-90. Harvard Faculty of Arts and Sciences. Harvard University. Web. 13 Jan. 2012. Kim, Byron. “Audio, Byron Kim, Synecdoche, 1991-present.” Edited Interview. Audio post. MoMA Multimedia. MoMA, New York. Web. 11 Jan. 2012. Lund, Darren E., and Paul R. Carr. “Exposing Privilege and Racism in ‘The Great White North: Tackling Whiteness and Identity Issues in Canadian Education’.” Multicultural Perspectives 12.4 (2010): 229-34. EBSCO. Web. 14 Nov. 2011. Marien, Mary Warner. Photography: a Cultural History. Upper Saddle River ( N.J): Pearson Prentice Hall, 2006. Print. McIntosh, Peggy. White Privilege and Male Privilege: A Personal Account of Coming to See Correspondences through Work in Women’s Studies. Wellesley, MA: Wellesley College, Center for Research on Women, 1988. Print. “Paul McCarthy & Mike Kelley – Heidi (1992).” Web log post. Art Torrents. 7 Mar. 2008. Web. 15 Jan. 2011. Reckitt, and Peggy Phelan. New York, NY: Phaidon Press, 2001. Rogoff, Irit. Terra Infirma: Geography’s Visual Culture. London: Routledge, 2000. Print. “Miss March, April, and May” Collage on paper, 22 x 30 inches. Based on my own subjective perceptions there are eight black, two non-whites (latino perhaps), and six white models represented. A similar number of tags was cut from each model. Some of the lighter toned samples are not from whites, but lighter areas or highlights of non-whites As well, some darker toned skin tags come from whites. Where does one begin and the other end? Is it possible that racial categorization is dependent on more than skin colour? If so, what? What does the answer to that question (as well as how we classify based on skin tone) say about us? Using tags cut from three issues I chose models with skin tones that fall in the middle range. Based on my own subjective perceptions there are eight black, two non-whites (latino perhaps), and six white models represented. This reminded me of Rosemarie Fiore‘s work on paper with fireworks. Not exactly of course, but the stacking of the circles evoked her images for me. First the tags are arranged in random order, then in order from darkest to lightest, then with the very darkest and the very lightest removed. Some of the light samples are not from whites, but lighter areas or highlights of non-whites, as well as some darker tags coming from whites. Completed late this morning is another in the Skin Tags series. In this case, all the parameters are the same as the previous one except that the samples are three-quarters of an inch in diameter. Skin Tags (Vogue May 2011), collage on rag paper, 22×30 inches. Over the past couple of weeks I have extracted samples from the April 2011 British Vogue issue. My first impression is that it is whiter than the American Vogue, but this may not apply for every month. Italian Vogue produced an issue devoted entirely to black models in July 2008. Obviously it not indicative of the overall trend of the magazine. I followed the same parameters for this work as for the last one, Skin Tags (April 2011) with one exception. In this case the samples are in order top to bottom, left to right as they appeared in the magazine. Skin Tags (British Vogue April 2011), collage on paper, 22×30 inches. The following image in the Skin Tags series is from the April 2011 issue of Vogue. This time the tags (7mm diameter) are spaced slightly farther apart on a larger sheet of paper. The tags are also sampled without revealing specific body parts such as eyes, mouth etc. Some are therefore ambiguous about the location of the body they are punched from. There are a total of 309 tags. Skin Tags (Vogue April 2011), collage on rag paper, 22×30 inches. EDIT: Sept, 2012 – This series of works is discussed in my thesis paper. Currently, I am collecting issues of Vogue (the latest being a 900+ page issue) in order to continue the project. All the parameters are the same as British Vogue except that the tags are three-quarters of an inch in diameter. I followed the same parameters for this work as for the last one, Skin Tags (April 2011) with one exception. In this case, the samples are in order top to bottom, left to right as they appeared in the magazine. The samples from this issue were, to my eyes, noticeably lighter than American Vogue issues. In this case, I took samples from bodies with large enough areas of skin that did not include recognizable features, although initially appearing the same as the previous works. The tags as a group become slightly more ambiguous as to their nature. Folds present in some of the tags also bring to mind Deleuze’s theory of the fold, as well as the sexual nature bodies. The sheet of paper is also larger allowing the space between each 7mm circle to expand. There are a total of 309 samples. My initial impulse in this project was to survey the skin tones represented in Vogue, an iconic fashion magazine. I use a hole punch (5mm and 7mm ) to take samples. One sample is taken from each person represented as long as there is enough skin visible to fit the dimension of the hole punch and/or the photo is not black and white. The small circles are then glued onto a sheet of rag paper in a grid format. Through the act of cutting and hole-punching I begin to de-contextualize one of the devices that is normalized within whiteness in order to render it strange as opposed to normal or ordinary. The skin tones stretch the meaning of a black/white binary. Are all the lighter skin tones from whites? Where does white end and non-white begin? An NFB film called The Colour of Beauty. The online version of the Vogue Italy issue that featured only black models that is referred to in the film. The notion of extraction has been raised in a critique discussion. To draw or pull out, often with great force or effort: extract a wisdom tooth; used tweezers to extract the splinter. To obtain despite resistance: extract a promise. To obtain from a substance by chemical or mechanical action, as by pressure, distillation, or evaporation. To remove for separate consideration or publication; excerpt. a. To derive or obtain (information, for example) from a source. b. To deduce (a principle or doctrine); construe (a meaning). c. To derive (pleasure or comfort) from an experience. Mathematics To determine or calculate (the root of a number). a. A passage from a literary work; an excerpt. b. A concentrated preparation of the essential constituents of a food, flavoring, or other substance; a concentrate: maple extract. Some of these meanings can offer something to what is happening in Skin Tags. The skin tone sample is being pulled out and separated from its source for consideration. Because a hole punch is being used there is not only implied violence to skin, but the skin must be obtained despite resistance. Information and meaning is derived from the each sample, but also in context of the samples grouped together in a collage. I am also now thinking about the work in other terms as well. I am thinking about dissection where part of the process involves extraction of organs etc. (historical anatomy theatres and modern day views of dissection in programs like CSI and Bones). Peter Moeschl in Images of the Body: On Sensory Perception in Medicine and in Everyday Life (2000) discusses the idea that when the interior of the body is viewed that it invokes the perception of injury. Not only that a human being is injured, but that the aesthetics of the body have been disrupted. While Skin Tags does not deal with the interior of the body, it does invoke a sense of injury. Other possible referents might be Julia Kristeva’s Powers of Horror (2002). Although this goes in a different direction than my thesis. Barbara Fischer in Love Gasoline (2001) reminds me that there is no longer any looking without being looked at, so it is important to also consider how I am being implicated in the work. Benthien, Claudia. Skin: on the Cultural Border between Self and the World. Trans. Thomas Dunlap. New York: Columbia Univ., 2002. Print. Fischer, Barbara. Love Gasoline: an Exhibition of the Body in Sculpture, Performance, Video, and Photo-based Works of the Later 1960s and Early 1970s. Toronto: Mercer Union, 2001. Print. Moeschl, Peter. “Images of the Body: On Sensory Perception in the Medicine and in Everyday Life.” ReMembering the Body: Body and Movement in the 20th Century. Ed. Gabriele Brandstetter and Hortensia Voelckers. Vienna: Hatje Cantz Publishers, 2000. 286–300. Print. 5mm hole punches, sampling skin tones, from February 2011 Vogue.